Arkansas’ White River is considered by many as the fly fishers’ dream. Home to several species of trout, you’ll definitely want to come back after a unique fishing experience on its lovely tail waters. This is probably one of the main reasons why our guest speaker, Davy Wotton, has traveled all the way from Wales in the United Kingdom and ended up in Arkansas. Davy is one of the best known fly fishers not only in the country, but around the world as well. 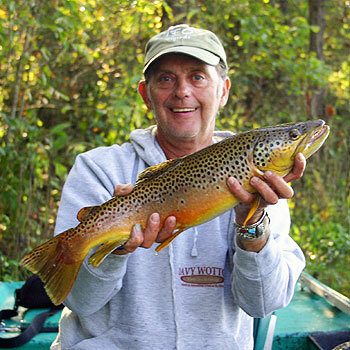 He is a consultant to a lot of fly fishing organizations in different countries. He is also active in conservation. In Atlanta, he was awarded the USFW Director of Fisheries Award for Outstanding Voluntary Services Toward Fisheries and Conservation. He also works with Fly Fish TV and has produced a series of two DVDs – Davy’s Favorite Flies and White River, scheduled to be released this year. These achievements began to take form when, as a young lad in the ‘50s, he watched a fisherman catch a trout – and to say that he was hooked is an understatement. He devoted his life to fly fishing ever since. The White River System is a tidal water system. It came about in the 1940s and early 1950s when the Core of Engineers constructed dams primarily for flood control. These engineers essentially dammed up a warm fishery environment that enabled cold water to be released from the lakes above. The cold water environment, also known as tailwater became suitable for the habitat of trout and other cold water species. The White River is located in the northern region of Arkansas just south of the Missouri border. It goes up into the state of Missouri and comes back down again into Arkansas. Davy fishes mostly in the section below the Bull Shoals dam, which has around 90 miles of continuous water on the White Water System and five miles of tail water from the Norfork River. All the areas below the White River’s high water mark is fishable. The Core of Engineers actually owns the river for all intents and purposes, but there are no restrictions as far as access below the high water mark. Unlike in other places out West where you can’t even get out of a boat, at White River, you are able to get out of the boat and wade fish. You will have total freedom and access on their river systems. However, if there is human habitation along the river, you will need to know the owner of the property to access the river directly from that point, or else, there would be an issue. The Arkansas Game and Fish Commission currently provides access to the river by way of concrete boat ramps. In addition, trout docks or resorts along the river enable people to access the river directly in front of them. The main access points in the upper section of the river are roughly between 60 to 70 miles apart. The White River Systems offers four species of fish - the brown trout, the rainbow trout, the brook trout, and the Snake River cutthroat trout. The Arkansas Game and Fish Commission, together with the Norfork National Fish Hatchery has issued a mandatory requirement to introduce rainbow trout at approximately 11 inches. In the cases of brook trout, cutthroat, and brown trout, they are stocked into the system as small fish, five to seven inches in average. This gives them the potential to survive and grow large. It also eliminates excessive amounts of harvest for those smaller fish. Although the river system has a carryover of the smaller fish stocked in the river at this time, Davy foresees, that the trout introduced into the White River will grow to around two million or more a year. This is also one of the main reasons why the river is considered by a lot of fly fishers as legendary. One great thing about the White River is that you can fish 365 days a year. The only restriction is the Bull Shoals Dam, which is closed during the spawning season in November, December, and January and only opens again during the first week of February. Other than that, you can go fly fishing any day of the year. Since the White River is a tailwater fishery, majority of the food base are crustaceans, which include sour bugs, scuds, crayfish, and baitfish. That is why there is not a day of the year that you cannot go river and catch a bunch of fish - even big fish as well. Once you fly fish in the White River Systems, you are totally at the mercy of water release. The dam undergoes certain stages or levels, which affects the amount of water that is being released. The behavior of the fish is also a great factor that affects your catch of the day. In some cases, fish feed well when the water rises, but in other zones on the river, they feed better when the water is actually falling out. Davy chooses his line based on the depth and speed of the water as well as how he wants the fly to be presented to the fish he’s targeting. He also orientates the fly line he’s using to the relationship of the boat drifting downstream to the zone you’re fishing. Davy tributes his expertise to continuous learning over the years. “The more years of experience you have, the more you fly fish, the more you understand the quarry you pursue and its habits, the more fish you’ll catch at the end of the day,” he says. He warns that it is not an easy and pleasurable learning experience, but It is part of what makes fly fishing so fun. “Every time you catch a fish, it gets your adrenaline going and you disregard all the elements you’re in,” he concludes. Listen to our full interview with Davy Wotton and learn more about fly fishing in Arkansas’ White Water Systems.